A comet, when it enters earth's atmosphere from outer space, is pulled toward the surface by gravity. As it descends, the friction of our atmosphere increases its heat so that it soon burns, leaving a visible trail of gas and vapor to mark its passage. 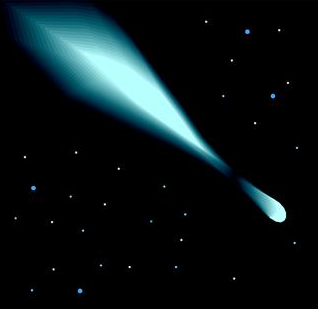 In much the same way sin seems to exert a gravitational pull on our spirits, and in today's reading Moses describes the comet trail of nation's descent into it. 1. A softening toward idol worship - Exodus 34:12-14. 2. Polite (or curious?) participation ("...eat of his sacrifice...") - Exodus 34:15. 3. Intermarriage - Exodus 34:16. 4. Idolatrous practices entering the family's culture and legacy - Exodus 34:16. 5. Absorption into the mainstream culture as individuals make idols for themselves - Exodus 34:17. Of course if we're not married, we can place limits on whom we would consider as a possible spouse. As for our kids, in our time and culture where we have little say in who our children marry, we can pray. Participating in practices that have their origins in other religions. One popular type of physical exercise, yoga, originates in Hinduism. Though many argue that they do yoga exercises without any acknowledgement of the spiritual aspects of it, others warn that any involvement with it is not spiritually wise. Another trap might be decorating our homes with the paraphernalia of other religions - e.g. Buddha statues or shamanistic masks. Allowing our culture's ideal of syncretism to infiltrate our churches and our personal lives. No matter what our culture's wise ones say, the Bible makes it clear that not all faith journeys lead to God (John 14:6). The warnings, above, are not politically correct — but when did God ever concern Himself with our political correctness, except to warn against it? I would much rather err on the side of caution and inherit God's blessing (Exodus 34:6,7a) than allow my life to enter sin's atmosphere and be pulled down by its gravitational force. PRAYER: Dear God, since You don't change, I need to take Your warnings to stay away from sin and idolatry very seriously. Please help me, by Your Spirit, to become aware of and root out any idolatrous thing in my life. Amen. The Subtle Body: Should Christians Practice Yoga? Help from Hindu Quarters — The New York Times on "Take Back Yoga"